The true excellence behind everything we do is Our Team. Sarah & Bernard Bouissou have been cooking together for almost 30 years! They started their catering business in 1990 while beginning their family. Creating events large and small, our team of highly trained chefs, bartenders and wait staff take care of all the details to ensure a fabulous event. Many of our staff have been with us for a number of years and take great pride in the company. They specialize in unsurpassed hospitality and strive to exceed every expectation possible. If the client can imagine it we can create it! Sarah Bouissou, Owner & Executive Chef, began her cooking career at Claude’s Hohokus Inn in New Jersey. In 1985, Sarah spent 3 months training in Vichy, France at the two star Michelin rated restaurant Le Violon d’Ingres. Upon returning to the states, Sarah became the first female chef hired by Daniel Boulud at Le Cirque where she met her future husband Bernard. Sarah and Bernard were married in France on Bastille Day in 1990. In 1991, Sarah opened Sarah Bouissou Catering which focuses on total guest satisfaction. 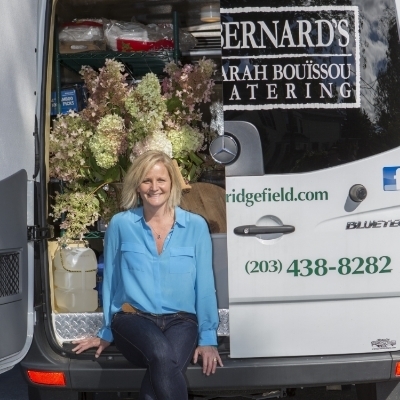 In addition to Sarah Bouissou Catering, Sarah operates her four-star restaurant Bernard’s, spends time with her family of four daughters, and is an outstanding community member in Ridgefield, Connecticut. Sarah was named Ridgefield Rotary Club’s 2013 Citizen of the Year for her extraordinary work with local non-profit organizations, including the Ridgefield Symphony Orchestra, the Visiting Nurses Association, and many more. Despite Sarah’s involvement, she always makes her clients feel as though they are her only priority. Sarah is committed to challenging the norms of catering to bring her clients fresh and exciting new menu ideas that are as individual and fun as the people she works with. Bernard Bouïssou was raised in the St Etienne de Tulmont, France where his culinary apprenticeship began at the age of 13, in the tradition of many great European chefs. In 1984, he moved to the US, where his remarkable career began in New York City, working under Chef Daniel Boulud at Le Plaza Athenee and Le Cirque Restaurants (where he and Sarah met)Bernard went on to become Sous Chef at Le Cygne and then Banquet Chef at Tavern on the Green, after which he worked as Executive Chef at La Panetiere in Rye, New York. Bernard and Sarah opened Bernard’s in March of 2000. Continuing the catering business from their Ridgefield location, SB catering is thriving with Bernard’s creativity and experience. When Bernard is not in front of the stove he can be found tinkering in his workshop (creating trays and buffet displays) or vegetable gardens where we grow upwards of 30% of our seasonal produce. Bernard’s was voted Best Overall Restaurant in CT by Connecticut Magazine 2014 and most recently named Business of the Year in Ridgefield. Elizabeth Kenny, Off Premise Catering Manager, has a long career in high end hospitality. Elizabeth started as an office manager overseeing Lundy Bros in Brooklyn, and moved from there to Windows on the World (NYC), Angelo & Maxie’s Steakhouse (NYC) and Wee Burn Country Club (Darien). Elizabeth’s goal is to make clients feel like a guest at their own party. If the client can imagine it, we can produce it. She is committed to making sure all of the details are taken care of so that the client does not have to worry about them. She excels at making guests feel comfortable and having the answers to just about any question at the ready!